Omnislots is a new slot site on the UK market. The name has its origin in the Latin prefix Omni which according to Wikipedia means “all” or “every.” Omnislots are of course talking about slots in this case. With a very well structured presentation in a menu bar with the sub-categories, it is easy to navigate between different types of games. If you choose, for example, video slots, you can quickly click to the classics and find the popular slots like Jackpot 6000 or Mermaids Millions. Omnislots are very generous when it comes to a variety of slots and the welcome offer. They offer all new customers a deposit bonus of 100% up to £300 and 50 free spins. How Omnislots choose to distribute your free spins is somewhat unique. Here you are not locked into play only Starburst or Jack and the Beanstalk like other casinos. Here you get the corresponding value of the spins (£50) directly into your account in the form of a bonus and can then choose which slot you want to test your luck on. Pretty simple setup and fun to choose for yourself which slot you decide to play on. Everything is about slots, as the brand name implies, and so are also the campaigns. As a way to brag about its range of slots and offer players variation, they have a rolling campaign; Slot of the Week. The concept is that every week 10 free spins are handed out on a selected slot. The only requirement is that you have deposited at least £20 or more during the previous week, and you’ll get free spins next Monday at 17:00. Keep an eye out for Omnislots cashback campaigns. Quite a bit of information is on their website, but it seems to imply that they give back a percentage of potential losses. According to the site, players are promised juicy cashback bonuses. Unfortunately, given no date when it is awarded, it is recommended to keep an eye in your inbox. Are you a high roller? You will be offered to join the famous Omnislots VIP club. The benefits are similar to many other slot sites where you apart from a personal service and a dedicated VIP Manager will receive customized bonuses, cash backs when having a bad month and invitations to events and trips. Those who belong to this exclusive group will also be selected to test the new slots before they come out to the market. That there are slots of slots at Omnislots is an understatement. With the slogan “keep on spinning” they offer slots from the major gaming providers NetEnt, Yggdrasil, and Microgaming. What makes Omnislots unique is that they also offer slots from the smaller and sometimes unknown suppliers such as Amanet or Cryptologic. At first glance, the first thing you see are the new slots. 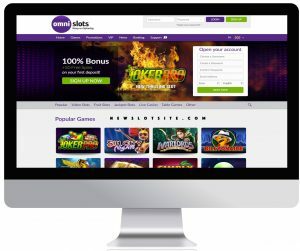 If you are interested in brand new slots machines, this is the site to visit. Omnislots also have the opportunity to test the games without playing for real money, which means that you can explore different slot machines before you test your luck with real money. For customers more curious about the jackpot games, you will find both classics like Mega Moolah, mixed with new ones like The Slotfather or Slot Angels. A clear focus of Omnislots has apparently been getting slots to load quickly, something that also becomes apparent when playing on mobile phones. With a completely mobile adapted loading platform games at the same speed regardless of the iPhone, Android, or from a computer. Something that makes the experience on better is that loading time is significantly reduced compared to other slot sites. Being a new slot site, Omnislots have the standard support options available for you. You can reach them via email or chat. What is a bit different is that they have chosen a profile where they are investing heavily in social media and encourages its players to become friends with them on Facebook. This approach suggests honesty, transparency, and goodwill. When it comes to payment solutions, the name “Omni” fits right here. In addition to the traditional payment methods such as Visa, MasterCard, and Neteller, Omnislots also offers the possibility to make the payments using other solutions such as Giropay, Sofort and Bitcoin for those who prefer it. Omnislots is a new casino for those who like slots. An easily navigated site that feels simple, whose simplicity makes the page fast, efficient and completely without irregularities. Like many new slot sites, they attract new players with a high deposit bonus.